If you have a tooth that’s suffering, you might think you need to have it extracted — but don’t be so hasty! A dental crown may be able to save that part of your smile, restoring its form and function. 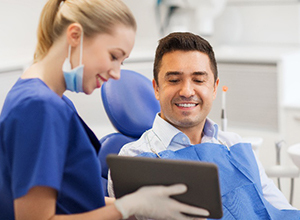 In our practice, we make full use of dental crowns in Enfield to prevent extractions whenever possible. If you ever suspect that you need a new restoration, or that one of your old restorations is failing, please contact us so we can talk about how to get your oral health back on track. A dental crown is a custom-made tooth cover that your dentist in Enfield places over the entire part of your tooth that is above the gum line. 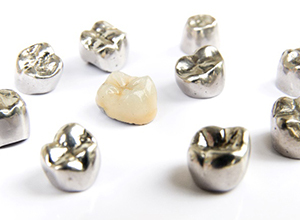 Crowns can be made of various materials, including gold, silver, porcelain, and porcelain fused to metal. Metal crowns are very sturdy and may last for a long time, but many patients dislike them because they look nothing like natural teeth. 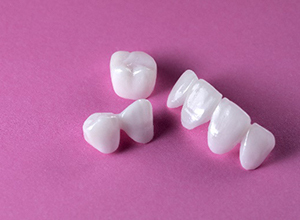 For improved aesthetic value, most people prefer all-porcelain crowns. The color of porcelain is very close to that of natural teeth, and it reflects light in much the same way as teeth. It is also quite strong, so a porcelain crown can last for a decade or longer if it receives proper care and no unfortunate incidents befall it. You need to have a root canal, and a crown will be necessary to protect the tooth after the procedure. A tooth has faced such severe decay or damage that, without protection, it is in great danger of suffering from further problems. You have a missing tooth and are going to get a bridge. Crowns will be used on the teeth adjacent to the empty space in order to support the artificial tooth between them. You are unhappy with the way one of your teeth looks and would like a crown to improve its appearance. You have cracked tooth syndrome, in which microfractures in a tooth cause extreme sensitivity. A crown may be able to shield the tooth and relieve your pain. What Is the Process of Installing a Dental Crown? It usually takes at least two visits for your dentist to install a crown. On the first visit, we’ll prepare the tooth. We may have to fill it or file it down so it will be able to fit well under the crown. 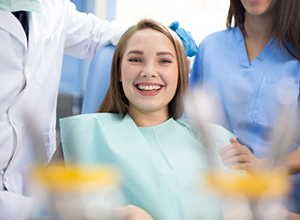 Then, we’ll take an impression of the area, which a laboratory will use to create a crown that will fit in your mouth and provide you with a strong bite and attractive smile. We’ll give you a temporary crown to safeguard your tooth until your permanent, custom crown is ready. When you come back for your second visit, we’ll use a special cement to attach the crown. You may just walk away with a restored smile and heightened confidence!